Sansui SR222 mk2 turntable. Condition is good. New belt and aftermarket stylus on an Ortofon cartridge. All works as it should. Few marks on the cover but no cracks. Collection welcome, otherwise I will remove the platter an headshell from turntable for posting via a courier. > 1 x Stylus Needle. A5 Leather Loose-Leaf-Ring-Binder-Notebook Macaron Colour Agenda Planner Diary. -Use with Gramophone and record player,work on Vinyl record. Type : Needle. Material: plastics ceramic. Shure V-15 Type 3 Boxed. Condition is very good used with Supertrack Plus Stylus, All working well, original plastic case and box. Dispatched with Royal Mail 1st Class recorded. Shure v15 type 111 as clean as you will find and in perfect working order. Back construction consists of a paper layer sandwiched between two sheets of high-density polyethylene (HDPE) with a translucent HDPE front. This equals or surpasses the discontinued VRP inner sleeves. Linn Sondek LP12 motor in perfect working order. 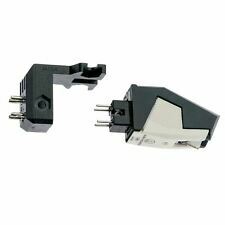 2x vintage ortofon mm cartridges ff10/ff15 used. made in denmark both working order but one has broken stylus. free post to uk mainland. payment by paypal please thanks for looking. Nice condition. Minimal use. Just the stylus. Suitable for all turntables. Sweep it goes the other way. You can enjoy listening to your records while they are being cleaned. Simply place Sweep it on your turn-table and make sure that the brush is placed before the needle. 2 x Black Headshells. H8S Standard 1/2' aluminum turntable headshell Diamond Stylus Fitted. High Quality Standard 1/2' Aluminum Turntable Headshell. Protective Stylus Cover. BLUE: Left channel negative(L-). Original Thorens td 160 Super plinth/base. (No bottom board) Surplus to requirements since I upgraded to an expensive, solid wood plinth. Sounded exactly as it did before! Nice condition but slightly less rich colour on the front. What's in the pics is all there is, the wood and 2 transit screws and springs. The garden seat's not included. Probably same as the TD160, 160B and others but please check. Outside measurements: 438 mm. x 349 mm. x 62 mm. deep x 19mm. thick. Post by Hermes 3 to 5 days (not as displayed above). Or cash please on collection. UK only. Thanks for looking! 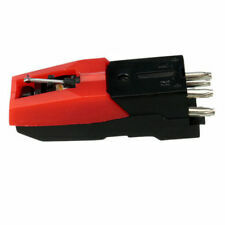 Sold as a spare part for a Logic DM101 Turntable. See Photos for Condition. Michell record clamp machined specially to fit Rega turntables and most other turntables with similar size spindles,. 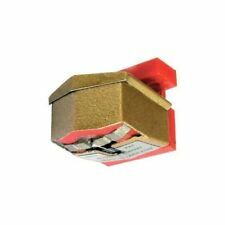 Shure V15 type III cartridge plus 2 Used Stylus. The cartridge is in good used condition, one stylus is generic and I do not know the age. The stylus pictured in the gold box is a Ed Saunders produced and has had minimal use, maybe 30hrs at most. Only selling as I have another of these and don’t need 2. UK bidders only. There are features which are new for record cleaning machines in this price range. Project Audio Presents: VC-S Vinyl Record Cleaner. (no springs). It is super powerful and cleans a record in 1 max 2 rotations (best is 1 turn forward, 1 turn backward). The perfect combination, we believe you will not find a better set up if you are looking for aesthetics and quality sound on a budget. WE KNOW YOU NEED IT! Channel separation (at 1kHz): more than 15 dB. All in One Music Systems. Stylus Cleaners. Stylus Shape Portable Music Players. Pro-Ject Turntable Spare Parts. Valve and Tube Essentials. Tape Cleaners. QED Profile Audio Interconnects - RCA to RCA 1.0m Pair 2013vk13(265). IT IS IN GOOD CODITION AND WORKS REALLY WELL UPON TESTING. STYLUS TIP ELLIPTICAL. CHANNEL BALANCE 2.0dB. You will note that it is supplied with mounting screws. Black Acrylic Turntable Platter Mat. fits PRO-JECT. IMPROVE LOOKS & SOUND! Featuring an attractive high gloss finish and clean gloss black logo free design in the label recess. Most mats are 2mm thick, with our mat at 3mm you gain the benefits of the extra density without the need to adjust the VTA. Rega turntables. Fitting and set up of the platter is literally a case of lifting off the old platter and placing the new one on. Clear Acrylic Turntable Platter by Cherry Audio for. Upgrade the aesthetics and acoustic performance of your turntable with this excellent Cherry Audio Acrylic Platter. CHANNEL DIFFERENCE < 3dB @ 1kHz. Silver Headshell. H8S Standard 1/2' aluminum turntable headshell This Headshell fits most turntables with the S-Shaped. HIGH QUALITY HEADSHELL. 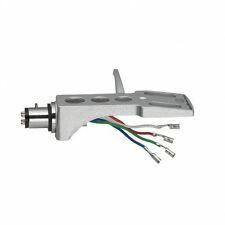 High Quality Standard 1/2' Aluminum Turntable Headshell. Tonar Pure Cork Turntable Platter Mat 2013-adrian86(223). Analogue Studio Leather Turntable Platter Mat (Black) ockendonandy(154). Do not use Vinyl Clean on oily or wet surfaces. Vinyl Clean should be replaced after 8 months, or earlier depending on usage. GENUINE REGA HUB BEARING WITH NEW BELT. Shure M75 Cartridge With Genuine Shure Stylus. I now only leave it once my own has been received. Use with Gramophone and record player,work on Vinyl record. Material: plastics ceramic. We will greatly appreciate for your cooperation. We will send it as a personal gift with a low value. -To bring you perfect tone quality. Xpression II (all models, including 'Comfort'). - Xpression III (all models, including 'Comfort'). 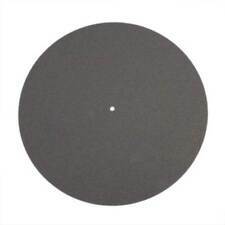 Pro-Ject (Project) Coloured Felt Turntable Platter Mat (Light Grey) - 12". Pro-Ject Turntable Spare Parts. OM Styli also available for renewal or upgrade. This allows for easy servicing and upgrade possibilities. Stylus Profile: ELLIPTICAL. Oxford THAT'S AUDIO Audio Turntable Stylus & Accessories. Y Fork Connectors. I do not know its history but here it is - it will need to be refurbished.